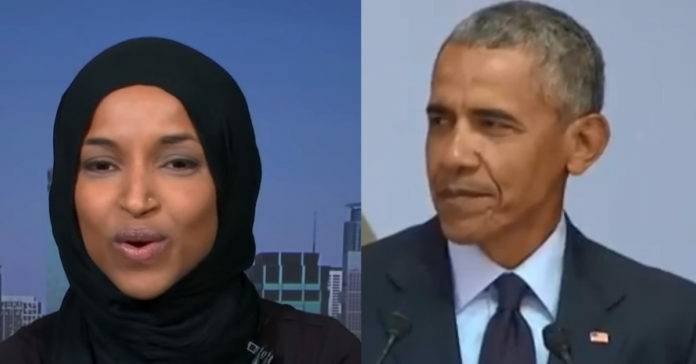 Ihan Omar just committed the cardinal sin in Democratic politics – she trashed Barack Obama with a blistering rebuke. She, and this is even more devastating for the left, said we should not be angry at Trump because he is more of the same from the DC establishment. The Democrats, who have been trying to paint Trump as an absolute monster for two years, will be furious that Omar says Trump and Obama are similar and both are tools of the establishment. She goes on to call him a ‘polished mirage’ – in other words, a fraud – before accusing him of committing atrocities with is drone program and blasts him for caging kids at the border. From Politico: Having fled the civil war in her native Somalia at age 8, spending the next four years in a Kenyan refugee camp before finding asylum in America, her adolescence was spent questioning why the land of opportunity she had read so much about—her new home, the United States—was falling short of its promise. Landing briefly in the suburbs of Washington, D.C., and then in Minneapolis, she saw dire poverty. She saw broken schools. She saw people without health care. Naturalized at age 17, she set off for college in North Dakota, studying political science and beginning her journey as a community activist focused on nutrition and education. As the Somali population in her city continued to swell, so did the young activist’s discontent. By the time she ran for office in 2016, knocking off a 22-term incumbent to win a seat in the Minnesota statehouse, Omar was fed up—not so much with Trumpism, or with politics in general, as with the Democratic Party. As she saw it, the party ostensibly committed to progressive values had become complicit in perpetuating the status quo. Omar says the “hope and change” offered by Barack Obama was a mirage. Recalling the “caging of kids” at the U.S.-Mexico border and the “droning of countries around the world” on Obama’s watch, she argues that the Democratic president operated within the same fundamentally broken framework as his Republican successor. “We can’t be only upset with Trump. … His policies are bad, but many of the people who came before him also had really bad policies. “I don’t believe that tiptoeing is the way to win the hearts and the minds of the people,” she says. “I get saddened by some of my freshman colleagues who can’t understand that within their districts the idea of Medicare for All is extremely popular.